First Line: I keep driving around, but there's nowhere to park near the shop. 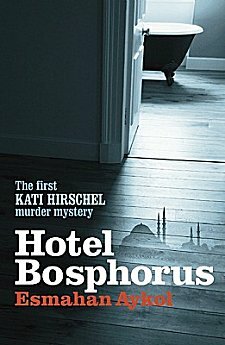 Parking in Istanbul can be a problem, and since Kati Hirschel is usually running a bit late to open her business-- the only mystery bookshop in town-- she's just going to have to park and run. Having recently lost her part-time employee, Kati does need to hire someone else, but she's also anticipating meeting Petra, an old school friend she hasn't seen for years. Kati is a German ex-pat who's fallen in love with Istanbul. Petra went on to become a very popular actress in Germany, and has come to Turkey to star in a new film; however, everything is put on hold when the film's director is found murdered in his hotel room. Petra is the prime suspect, and Kati can't resist running her own amateur investigation. After all, reading all those mysteries has surely taught her something. I found that my enjoyment of this book relied a lot upon my opinion of its main character, and I was alternately exasperated and delighted. I did really like the insider's point of view, especially since Kati is an ex-pat because it exposed both Western prejudices about Turkey as well as Turkish stereotyping of Europeans. Moreover, since Kati's investigating style was rather hit or miss, I also learned quite a few things about different sections of Istanbul. Kati has always been single, and never passes up the opportunity to ogle-- or bed-- a handsome, interesting man, and this led to one of the things that annoyed me. A handsome, interesting (and interested) policeman falls right into Kati's lap, and after a brief encounter, she dumps him with no explanation. You see, Kati was raised to hate the police, and she just can't overcome that prejudice. Then there was the way the book was written. Kati is speaking to us, and although I don't mind being brought into the story, and I can think of many, many books in which I loved the first person viewpoint, I draw the line at constantly being referred to as "dear reader." As the dear reader of this review, I found this tendency made the narrative stilted and gimmicky. Kati's investigative technique was all over the place. If she was paid by the mile, she could hire all the employees she needs and never have to work in her bookshop again. This scattered approach allowed her to meet various characters such as stock film types and a stock mobster and his minions as well as take a trip to Berlin. No, this book isn't long on character or plot development, but I did find it a light, fun read. If it's substance you crave, I would strongly suggest reading Barbara Nadel's Inspector Ikmen mysteries which are also set in Istanbul. I wasn't particularly impressed for a few reasons: I wanted to learn more about Turkey, like, say Donna Leon writes about Venice and Italy and I wanted a more solid story and character development. I may give her second book a chance, as I've read it's out and am hoping that it's better. I tend to agree with Kathy's comment. I think I've learnt so much about Venice from the Leon books. FYI: The latest Guido Brunetti venture in "The Golden Egg," is superb. Lots of reflection, ruminating and trying to understand people and relationships. I agree about the TBR mountain and list. I think we need to petition for an extra day a week just for reading or clone ourselves or just say to heck with our other tasks. I'm lucky. I live near gourmet stores that deliver, so when I want to read exclusively, I get food delivered and just turn the pages. A benefit of big city living. There aren't that many places here that deliver. I wish there were because I don't think Denis would mind all that much!